You want to get on the cheapest flight from Cape Town to Walvis Bay. See our South Africa to Namibia flights page, for comprehensive coverage of flight routes between the countries. 5 August 2012. Air Namibia stops direct flights from Cape Town to Walvis Bay, but continues to offer 1-stop flights via Windhoek: "The change came due to the challenging weather conditions that are experienced at the coast almost on a daily basis. The fog in the air makes it difficult for planes to land and that is a concern to us and our passengers." said Paul Nakawa, a spokesman of Air Namibia. An alternative method of getting from Cape Town to Walvis Bay is by bus. The Intercape Bus offers a regular bus service from Cape Town to Walvis Bay. 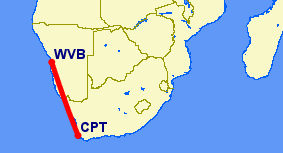 6 March 2015: From the end of the month Air Namibia will no longer fly via Windhoek on this route. The direct flight will also become a daily service.